Eoghan Daly is a research student with the Irish Centre for Research in Applied Geoscience (iCRAG) and NUI Galway. His PhD project is titled ‘Evaluating controls of acoustic noise propagation across the continental margin’. Eoghan Daly and Martin White from NUIG have set out to investigate how human noise travels through the water, from deep ocean to shallow shelf seas. In order to do this, equipment and expertise needs to be mobilised well beyond the scope of the PhD student and supervisor driving the project. For starters, a large collection of hydrophones (underwater microphones) to record ocean noise were deployed at the beginning of June 2018. This has been made possible by an initiative called iMARL, which is an ocean instrument pool run by the Dublin Institute for Advanced Studies (DIAS Geophysics Section), through SFI. Without the guys at DIAS we would never have got our hands on such an array of equipment. The offshore hydrocarbon exploration industry uses controlled source airguns or ‘seismic shots’ to prospect for oil and gas in subsurface layers of the seafloor. A by-product of this exploration is noise that propagates through the water column. Researchers at NUI Galway, in conjunction with DIAS Geophysics and iCRAG, are studying this noise as it propagates across the Irish continental margin. Some of the aims of the project are to ascertain if there is a difference in sound attenuation between typical slopes and submarine canyons and to identify possible areas of dampening or amplification. 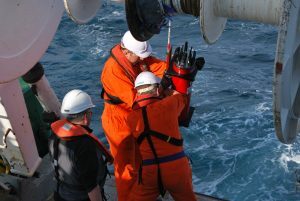 Hydrophones and recorders, as part of the iMARL suite of instruments, were used to great success in a recent offshore survey to measure sound propagation in the Porcupine Basin and have proved to be an integral part of the project. Under the Marine Strategy Framework Directive (MSFD) anthropogenic noise in the ocean is classed as pollution and Ireland has been tasked with measuring and monitoring that noise. 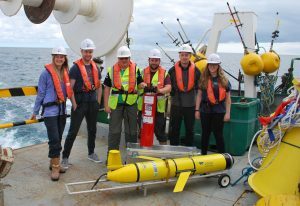 By quantifying and analysing ocean sound propagation, this project aims to raise understanding of noise levels, as part of Ireland’s responsibility under the MSFD. To read more about this project please read Eoghan Daly’s blog.